SHRI KSHETRA SRIKALAHASTI The significance associated with Panchmukha linga (the five-faced linga) SHRI KSHETRA SRIKALAHASTI The significance associated with Panchmukha linga (the five-faced linga) - Shiva Maha Purana, Vishnu Purana, garuda purana, bhavishya purana, skanda purana. Lord Siva, who manifests as panchamukha linga, is known by five names: Eesaana, Tatpurusha, Aghora, Vaasudeva and Sadyojaata. Aghora signifies the indestructable aspect of Siva; Eesaana signifies one who possess the 32 tattvaas (aspects) delineated by the righteous, one in whom the myraid forms of the Universe can be seen; described as Sadyojata by Suta Maharshi as shining softly in white; Tatpurusha signifying the ultimate moksham as revealed by the Guru of the universe, Lord Siva, to Rudra. The four-faced linga, with a fifth linga on top, is a sight to behold. It is significant to note that the Paramacharya of Sri Kanchi Kamakoti Mutt performed Kumbhabhishekam of the panchmukha linga in 1966. The east-facing facet of the linga shines forth representing Na which is worshipped by siddhas, devas and asuras (demons or rakshasas). The south-facing facet of the linga, representing Ma shines with the effulgence that can destroy the worlds. The west-facing facet representing Si shines with the whiteness of the cream of cow’s milk. The north-facing facet of the linga representing Va shines softly with a red tilak adorning a subdued white background. The heavenward looking facet represents Ya an embodiment of the thirty six tattvas. Thus the panchamukha linga represents the Lord’s name, Namasivaya, and signifies the profundity of mantras. 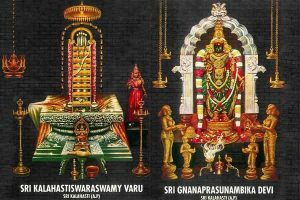 Siva is Viraat Swaroopa – the forehead represents Indra, the eyes represent Agni, the ears represent Yama, the face represents Nyruta, the arms represent Varuna, the nose represents Vaayu, the stomach represents Kubera, the navel represents Eesana, and the feet represents Prithvi (earth).